Most women have been touched personally and/or peripherally by breast cancer; its threat looms ever present. So it's not surprising that so much has been written about the disease. Anchoring the literature is Dr. Susan Love's Breast Book, which first came out in 1990. Now DaCapo Lifelong Books has published the sixth revised edition ($24, paperback). Beginning with a chapter on the healthy breast, the volume continues with 600+ pages about breast cancer: prevention strategies, clinical options, living with metastatic cancer, new genetic testing pros and cons, and screening controversies. This is the definitive source for information. For a more personal take, with humor and inspiration, Andrea Hutton's Bald Is Better with Earrings (Harper Wave, $17.99, paperback) walks women through dealing with pain and with radiation ("the KFC phase"), alleviating lymphedema with bra shopping, their self-image (earrings!) and others' images of them ("any mention of how you look, whether compliment or insult, reminds you of how you actually look"). Former NPR News executive editor Madhulika Sikka wrote A Breast Cancer Alphabet (Crown, $19 hardcover) to work her way through diagnosis, treatment and recovery. Personal and practical, it contains an often witty A-Z about "Cancerland": ("J is for Journey--it's a cliché we need to dispense with"; "H is for Hair--yes, you can make a federal case of it"; "Q is for Quitting [work]--there'll be days when you feel like it"). She says, "I hate all that claptrap about cancer being a journey. It's not. It's a debilitating disease, and our self-help culture tends to put the onus on the patient. I hope we can change the conversation." Banned Books Week update: For Brightly, Devon Corneal wrote a piece headlined: "I read banned books and so do my kids." And Bustle collected "22 ways to celebrate Banned Books Week, according to social media." The discovery of water on Mars prompted the Guardian to create a Mars in literature quiz. The New Yorker imagined "mysteries the Hardy Boys faced as they became Hardy Men," including The Legend of the Legacy Admissions. "Pop culture's best homages to Stephen King" were collected by Quirk Books. Step up to the bookshelves of the day: Büchertreppe. Three academic scientists--Anne H. Ehrlich and Paul R. Ehrlich of Stanford University and Gerardo Ceballos of National Autonomous University of Mexico--come together in a plea to halt Earth's sixth mass extinction. The attractive, large-format The Annihilation of Nature: Human Extinction of Birds and Mammals contains original illustrations by Ding Li Yong and 83 color photographs to accompany the authors' heartfelt arguments about the value of global and regional biodiversity and the danger of extinction that currently faces so many species. Ceballos, Ehrlich and Ehrlich begin by describing the incredible richness of Earth's diverse forms of life, which they call a "legacy"--humanity's duty to protect and appreciate. They outline the planet's previous five waves of mass extinction and their natural causes, making the point that the present sixth event is different in that it is caused by human actions. The current time period is called by many scientists "the Anthropocene," in which "a huge and growing human population has become the principal force shaping the biosphere (the surface shell of the planet's land, oceans, and atmosphere, and the life they support)." To illustrate the interrelatedness of human actions with every natural system, basic concepts such as the food chain are reviewed. The bulk of the book is then devoted to four chapters on extinct birds, endangered birds, extinct mammals and endangered ones. A combination of illustrations and photographs brings the reader's attention to the long-gone dodo and the passenger pigeon, and species in need of conservation like the Philippine monkey-eating eagle and the New Zealand kakapo (a nocturnal flightless bird). Extinct mammals include the baiji--a freshwater dolphin endemic to China, called the "goddess of the Yangtze"--and the Tasmanian tiger, a marsupial predator with several unique physical features including striped patterning and rearward-facing pouches on individuals of both sexes. Mammals in danger today include a variety of large species: whales, big cats (lion, tiger, cheetah), bears, apes, rhinoceros and elephants, joined by the small but scrappy Tasmanian devil. 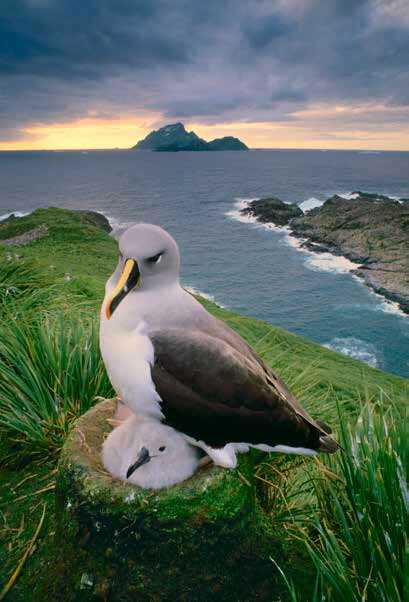 Having shared the remarkable and evocative profiles of so many creatures, the authors make their central point in chapter 8, "Why It All Matters." Here they lay out the many human-caused factors that contribute to species extinction and population extinction, including habitat destruction; chemical pollution and plastic debris; the introduction of non-native species and diseases; legal hunting and illegal poaching for meat or valued body parts such as tusks, horns and organs; and killing because of competition for food sources (the Sumatran orangutan, which vies with farmers for fruit) or because some species are seen as pests (crop-raiding Asian elephants) or predators of livestock (the gray wolf). Finally, climate change is deemed a major cause of ecological upheaval and extinction. If forced to choose a number-one factor, the authors name toxic pollutants, but climate change "may be the most threatening problem ever faced by humanity" and "climate change alone could be sufficient to finish the sixth great extinction now under way." Finally, Ceballos, Ehrlich and Ehrlich argue that biodiversity must be valued and protected for many reasons, from the aesthetic and ethical through the services they provide to the world's ecosystems and to humans: dispersal of seeds, insect and pest control, pollination and the sanitation role of scavengers such as vultures. Keystone species are described as those with an outsized impact on their environment. In an impassioned final chapter, the authors touch on means to conserve threatened species, including the question of direct or personal action versus institutional change. They consider ethical questions, such as whether to allow limited sport hunting of African elephants to help fund their conservation, and end with a message of hope, despite the dire picture painted by most of the book. "If we could just adopt a global policy of humanely and fairly limiting the scale of the human enterprise, gradually reducing the population size of Homo sapiens, curtailing overconsumption by the rich (while increasing needed consumption by the poor), then we might leave some room for the natural systems all humanity depends on." 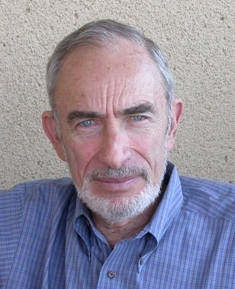 Paul R. Ehrlich is the Bing Professor of Population Studies and the president of the Center for Conservation Biology at Stanford University. Among his more than 40 books are The Population Bomb and Human Natures: Genes, Cultures, and the Human Prospect. He is one of three authors of The Annihilation of Nature, along with Gerardo Ceballos, a professor at the Institute of Ecology at National Autonomous University of Mexico (UNAM), and Anne H. Ehrlich, a senior research scientist emeritus at Stanford University. 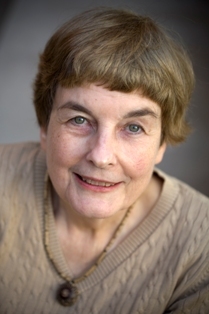 Anne Ehrlich is the coauthor of Extinction: The Causes and Consequences of the Disappearance of Species and The Dominant Animal: Human Evolution and the Environment. 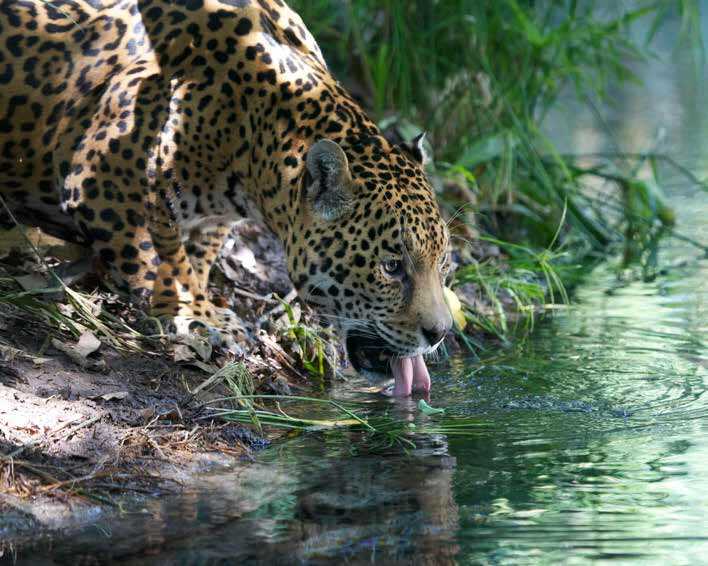 Ceballos is the author of Mammals of Mexico and Diversity of Mexican Fauna. What is meant in your subtitle by the phrase "human extinction?" There's not the slightest question in anybody's mind of why we're facing an extinction crisis, both of populations and of species, and that's human activities. 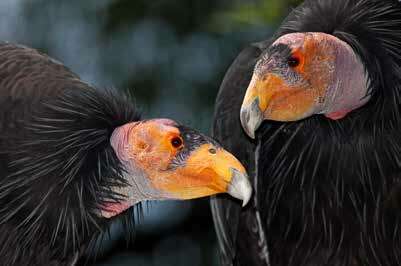 It's not extinction of humans, it's humans forcing birds and mammals to extinction. How does the three-author cooperative process work? First of all, Gerardo's first language is Spanish, mine is bad English and Anne's is excellent English. Usually Gerardo, or I, or Anne will sketch out a chapter, depending on where our expertise lies. I will edit it the first time around and ask Gerardo to explain some things--his English is excellent, by the way; no one has any trouble understanding him or understanding what he writes--but it's not colloquial enough in places. Then Anne goes through and replaces all my split infinitives and stuff like that. It's really an ongoing process. Gerardo is more in charge of the photographs in this particular book. He's a wonderful photographer on his own; he's published many books of photographs. We all have students and others who've helped us. None of us publishes anything in areas that are even slightly controversial without having a lot of colleagues go over it, and of course we had that done for this book, too. The cooperative writing process is three equal parts. The effort is equal, but we all have somewhat different talents and do somewhat different things. Our target audience is intelligent people who read books. It's not highly technical, but it's not dumbed down in any way. We hope to make it both an attractive book and one that's good reading. The whole idea is to introduce people to what we're losing. The average person on Wall Street has never seen a natural ecosystem or, say, the animals on the plains of Africa, and can't really picture what's going on. We hope to get people to picture what we're losing and get them to do something about it. What does "climate disruption" mean, and why use that phrase rather than the more familiar "climate change?" We adopted that phrase from the one used by Obama's science adviser John Holdren, who's a close friend of ours. He pointed out that it isn't just warming--that we are changing the entire climate. Things like the frequency of hideous storms are going to increase, and not every place may get warmer: some places may get cooler. "Disruption" is more accurate than "global warming," and even "climate change" doesn't carry the implication of speed. We know the climate has always changed, and most people, certainly the people who will read this book, would know that there were ice ages and things like that. So one of the big issues that's highlighted by using "climate disruption" is that the change is rapid. Getting older does not disrupt your life, but if you get married or divorced, that's disruptive. That's the main reason for using "disruption." Presumably many endangered species of birds and mammals didn't fit into this book. How did you choose which species to discuss? We chose the ones, first of all, that we know best. One of the problems, covered by a paper I was just involved in that got a lot of publicity, is trying to figure out whether or not we can prove beyond a shadow of a doubt that we're experiencing a mass extinction. One issue is that there are not enough biologists to track all the species we think may be endangered or, in fact, gone. For this book, we wanted a good variety of birds and mammals--the organisms most people relate to and certainly the ones we know most about in these terms. For instance, I've spent a lot of my life working with butterflies, but there are very few butterfly populations where we know enough about what's happening to say anything statistical about the rate of extinction. But birds and mammals we know. We know which ones we know interesting stories about, and there are a wide variety of them in a wide variety of circumstances. So this isn't an attempt to analyze what's happening to all birds and mammals, but rather to take a bunch of interesting examples and tie them into why it really counts. What about animal species beyond birds and mammals, and extending into plants--what is the scope of mass extinction relative to the story told in your book? The scope of the mass extinction is vast, but population extinctions are the absolutely critical thing. There are a whole series of reasons not to wipe out the only other living things we know about in the universe: one, of course, is just that they're interesting, fascinating and beautiful, but many people would consider it more important that they're working parts of our life-support systems. The importance of population extinctions is easily illustrated. If we could somehow miraculously preserve one population of every species on the planet, just one, permanently, we would lose no species diversity--but we'd all be dead in a few weeks, because we utterly depend on having lots of populations to provide us with what are called ecosystem or natural services. For example, honeybees are involved in producing something like $18 billion of agricultural produce in the United States--critical to giving us a much more varied and nutritious diet. If they all died out, we'd be in deep trouble, even though they could persist in, say, Italy and Africa and we would not have lost a species, but we would have lost a vast number of populations. And population extinctions necessarily go on at a much higher rate than species extinctions, because no species goes extinct until every one of its populations has been driven to extinction. 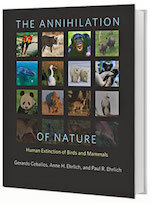 Photographs from The Annihilation of Nature: Human Extinction of Birds and Mammals by Gerardo Ceballos, Anne H. Ehrlich and Paul R. Ehrlich, Johns Hopkins University Press, 2015. 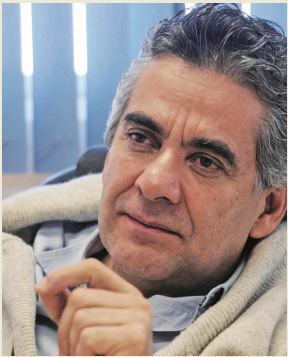 Author photos: Gerardo Ceballos courtesy Instituto de Ecología, UNAM; Anne Ehrlich by Anne Hammersky; Paul Ehrlich courtesy of the author. When he was 19 years old, Pete Fromm (author of If Not For This and As Cool As I Am) left college to get a job with the Idaho Department of Fish and Game and become the mountain man he had always dreamed of being. He spent seven months by himself in the forested wilderness near the border between Idaho and Montana. His job, which was to monitor two broods of salmon eggs planted in nearby rivers, took only 15 minutes per day. The nearest road was close to 50 miles away, and once winter hit, the only access was by snowmobile. 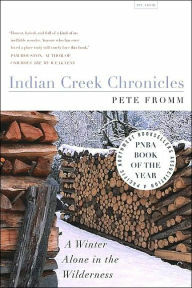 Indian Creek Chronicles, available from Picador, is Fromm's memoir of that winter of isolation and resilience, first published in 1993. "Before Wild, before Into the Wild, before Eat Pray Love, before A Walk in the Woods, Fromm wrote Indian Creek Chronicles, and it remains at the top of my list of favorite nonfiction titles," said Carol Spurling, co-owner of Bookpeople of Moscow in Moscow, Idaho. Marriage equality has created so much conversation in the United States recently that it is perhaps easy to forget that gay rights are a global battleground. This first novel from Chinelo Okparanta (after the story collection Happiness, Like Water) throws into sharp relief the historical and continuing struggles of the LGBTQ population of Nigeria. After Ijeoma's father dies in a bombing raid during the Nigerian civil war in 1968, she is sent to live with a grammar school teacher and his wife while Ijeoma's mother returns to her parents' village, promising to send for her. Weeks and then months pass without any summons. While she waits, Ijeoma becomes a de facto servant to her hosts, but her lot is lightened when she rescues an orphaned girl her age, Amina. Although Amina belongs to the Hausa, which means her people were on the opposite side of the war from Ijeoma's, the teacher and his wife grudgingly agree to let her stay. The girls play together, work side by side and share a bed. Soon their friendship blossoms into first love, but when their feelings are discovered, they face severe consequences. Discover: A girl falls in love with another girl and faces persecution in a story that gives voice to the struggles of Nigeria's LGBTQ population. Not on Fire, but Burning opens on catastrophe in San Francisco, in the not-too-distant future. A large object hovers over the bay, the Golden Gate Bridge collapses, and a mushroom cloud of radiation covers the city. Skyler, a young woman babysitting in an apartment overlooking the bridge, is caught up in the radiation, unable to save either the child she is watching or herself. She dies thinking of her youngest brother, Dorian. Ten years in the future, in a United States under constant terror watches, Dorian dreams of the sister he can't remember and his parents swear never existed. Dorian has learned to hate Muslims after the incidents in California and cannot tolerate the fact that his neighbor has adopted an orphan from a Muslim refugee camp. All the while he tries in vain to convince his parents that his sister was real and exists not only in his dreams. Discover: This cerebral novel set in the not-too-distant future uses a catastrophic event in San Francisco to explore questions of time and reality. New York City cartoonist and illustrator Peter Kuper (Mad magazine's Spy vs. Spy, Kafka's Metamorphosis) lived in the Mexican town of Oaxaca from 2006 to 2008. Chronicled in the autobiographical Diario de Oaxaca (2009), his time in this historical Amerindian and agricultural center inspired him to return frequently to savor the rich Oaxacan life. Ruins is the story of a young married couple's journey from New York to Oaxaca in search of relief from city stress. Samantha is on academic sabbatical and determined to finish writing a discarded novel. Her amateur artist husband, George, has been laid off from his job as a museum entomologist. Their marriage is teetering over a disagreement about children--she desperately wants them and he is reluctant. They hope that time in a different venue will resolve their differences. A graphic novel's success rests as much on the "graphic" as the "novel," and Kuper is a superb illustrator. His detailed and richly colored drawings of life in Oaxaca bring authenticity to the troubled relationship of Samantha and George. As he takes his characters into the rustic streets and markets, political protests and ruins of ancient civilizations, their personal concerns diminish in the face of bigger issues--just as their individual figures get lost in the large, mural-like illustrations. Kuper's art has always had an activist bent. Throughout are blue-line drawings of the United States' distressed political terrain below one monarch butterfly's long flight from New York to Mexico. As Kuper's novel illustrates, Samantha and George could look to the threatened monarch to find the resilience to make their way together in a difficult world. --Bruce Jacobs, founding partner, Watermark Books & Cafe, Wichita, Kan. Discover: Political cartoonist Kuper offers a poignant, richly illustrated graphic novel of a young New York couple trying to renew their marriage in the Mexican village of Oaxaca. Debra Music and Joe Whinney are passionate about chocolate. So passionate, in fact, that they moved across the U.S. (from New England to Seattle) to open the country's first organic and Fair Trade-certified bean-to-bar factory, Theo Chocolate. Former spouses who are still close friends and business partners, Music and Whinney share their expertise, their passion for ethical chocolate sourcing and their deep love of chocolate in all its forms in their first cookbook, Theo Chocolate. This is a cookbook for the serious chocoholic. It begins with an extensive explanation of Theo's sourcing and production processes, followed by detailed instructions on tasting, tempering and working with chocolate. The book's several dozen infusion recipes run the gamut from breakfast (chocolate-infused raspberry jam, chocolate-stuffed crème brûlée French toast) to savory small plates (roasted baby carrots with balsamic-bitter chocolate syrup) and main dishes (pumpkin-filled chocolate ravioli, a spicy chocolate mole sauce). Of course, there are plenty of desserts: cakes, cookies, brownies, puddings and the wonderfully named Hello Robin's Mackles'mores. The Drinking Chocolate chapter covers both hot chocolate and a few chocolate cocktails, and the Confections chapter contains plenty of advice on making and dipping Theo's famous chocolate ganache confections (as well as toffee, caramels and marshmallow bars). Discover: A mouthwatering cookbook of inventive chocolate-centric recipes, from the co-owners of Seattle's Theo Chocolate factory. A love letter to art, Alva Noë's Strange Tools: Art and Human Nature ironically lays out the claim that art is physically useless. Think of a doorknob, he says. "When you walk up to a door, you don't stop to inspect the doorknob; you just turn it and go right through." Doorknobs, Noë explains, are a common part of modern life; they exist because people need doors and doors need knobs. They are perfectly designed tools specifically because they are unnoticed. If doorknobs puzzled people, if people had to stop and think about how to use them, they'd be poorly designed. "This brings us to art," Noë writes. "Design stops and art begins when we lose the possibility of taking the background of our familiar technologies for granted." Art is a strange tool because there is no discernible use for it, but that is exactly why art is so necessary. Noë argues that art reaches a place in the human mind that is unexplainable by neuroscience. Choreographers, he says, don't dance--they show dancing. Painters don't make pictures, they call attention to painting. And the mind's capacity to discern this is proof that art is a part of humanity's identity. Discover: A lighthearted but provocative exploration of how and why humans like and need art. When a website recommends a book or a movie, gives you a list of companies looking for employees with your skill sets or finds a date online, algorithms are behind these choices. Based on bits of data that are analyzed in specific ways, algorithms--"a sequence of instructions telling a computer what to do"--play an increasingly important role in today's computer-science based society. In The Master Algorithm, Pedro Domingos, professor of computer science at the University of Washington, elucidates this complex world in relatively easy-to-follow language, and shows how and why people are on the hunt for the one perfect algorithm or computer program that will teach itself to process data. For instance, with a master algorithm, cancer treatments could be designed to treat patients as individuals rather than part of a subset, and super robots, rather than soldiers, could be used to fight wars. Discover: The way algorithms rule the cyber world and why it's important to understand them. British journalist Gavin Weightman (The Industrial Revolutionaries) examines the "eureka" moment when a new technology works for the first time, with the stories behind five of the 20th Century's most transformative inventions. The airplane, television, barcode, personal computer and mobile phone were innovations on existing technologies, and Weightman uses these inventions as a framework to recount the colorful stories behind the discoveries that ushered in today's most ubiquitous tools. He begins with the iconic Kitty Hawk and the Wright brothers' first flight on December 17, 1903, and quickly finds fresh and unexpected angles. A century earlier, the ballooning craze, and reports of a Viennese clockmaker who used counterweights, hoists and wings strapped to his arms to become airborne, became the talk of Europe. This inspired the British inventor Sir George Cayley to build a simple glider that resulted in the first true, fixed-wing airplane flight. Other characters, like the Berlin brothers Otto and Gustav Lilienthal, convinced that gliding would soon be as popular as bicycling, a sport they also enjoyed, carried on their own experiments and ultimately influenced the Wrights. Discover: Eureka is an entertaining account of the people and discoveries behind five major technologies that have transformed daily life. Artist and avid ornithologist, Matt Sewell has built a brand from writing and distinctively illustrating informative yet appealing books about birds. In Our Garden Birds and Our Songbirds, he presented two volumes, each exploring 52 favorite species from England--one bird for each week of the year. In Owls: Our Most Charming Bird, Sewell branches out beyond Great Britain and offers a worldwide compendium of various owls, nocturnal birds of prey. Watercolors rendered in Pop Art style and concise, lively prose highlight the individuality of 50 species of owls indigenous to diverse regions of the world. Sewell explores woodland varieties like the Northern Saw-whet Owl--native to North America--which is "smaller-than-a-blackbird and fluffier-than-a-three-week-old Labrador" and has "pleading, puppy-dog eyes" etched with a permanent look of surprise. The Great Gray Owl, with a head like a "geodesic dome inhabited by a bunch of strung-out hippies," is considered a wilderness variety, a stealthy hunter built to survive in northern, glacial environments. The Elf Owl is one of the smallest that loves cacti and inhabits the Wild West deserts of the U.S. and Mexico. The Crested Owl, indigenous to tropical Central and South American climates, has eyebrows that appear like "incredible appendages" and serve as camouflage when the bird is pretending to be a branch. Discover: This well-presented compendium depicts owls of all shapes and sizes as multi-faceted birds of prey. In The Natural World of Winnie-the-Pooh, Kathryn Aalto takes readers to the actual woods and farm--Ashdown Forest and Cotchford Farm--that inspired A.A. Milne to write his classic children's tales for his son, Christopher Robin, that feature Winnie-the-Pooh, Christopher Robin, Piglet, Tigger, Eeyore, Owl, Kanga and Roo. Aalto provides a concise biography of Milne's early life and his collaboration with illustrator E.H. Shepard before delving into an analysis of the real settings for the magical stories of the silly old bear and his various friends. Discover: A guide to the real surroundings that inspired A.A. Milne to write his classic children's stories. In Nicholas Gannon's warm and witty debut novel, The Doldrums, an isolated boy longs for adventure but discovers that friendship offers the most excitement of all. Eleven-year-old Archer was born into the Helmsley family, best known for the grandparents he never met, Ralph and Rachel Helmsley, explorers extraordinaire who disappeared on an iceberg in Antarctica two years earlier. But Archer's mother fears her son has his daring grandparents' "tendencies, as she so often put it," and rarely permits him to step outside the house at 375 Willow Street. (Gannon's colored-pencil drawings, as smoothly layered and polished as watercolor paintings, endow the tall, skinny, four-story house, inspired by a New York City brownstone, with a fascinating character all its own.) Overprotected Archer feels like a prisoner, and can't shake the words of a party guest who claimed to know his grandparents: "Always remember you're a Helmsley, Archer. And being a Helmsley means something." He vows to stow away on a ship bound for Antarctica to rescue his grandparents, and he finds just the right two friends to help him... his newfound neighbors Oliver Glub (focused on the planning, which was iffy) and the seemingly fearless Parisian Adélaïde Belmont, with a wooden leg she might have lost to a crocodile. 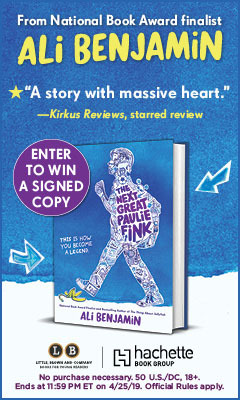 Discover: In this warm and witty debut novel, a boy wants to be less like his fearful mother and more like his adventuresome grandparents. The United States of America are gleefully dissected in Gabrielle Balkan's fabulously stylish, oversized book that's aptly, even modestly, named The 50 States. From Alabama to Wyoming, each state spans its own giant double-page spread, crisply designed but bursting with history, natural wonders, Native American Nations, cultural artifacts--from Alaska's Tlingit canoes to Arkansas quilts--unusual (and the usual) must-see sights, universities and museums, state-connected luminaries, animal descriptions, homegrown foods and festivals, inventions and much more. Each delicious tidbit is represented by one of Sol Linero's hip spot illustrations, reminiscent of artist Charley Harper in both style and palette. The colorful state maps all feature a brief introduction and a "Moments to Remember" box chronicling special dates in the state's history, from Alabama's 1965 Martin Luther King's civil rights march in Selma to the 1872 designation of Wyoming's Yellowstone as the first national park. A "Key Facts" box lists the capital, bird, flower, tree, etc. The factual nuggets are curated for a wide audience and age range; for example, the Pennsylvania-connected personalities are Andy Warhol, Billie Holiday, Roberto Clemente, Taylor Swift, Jerry Pinkney and "Nelly Bly." On the New Mexico map, browsers find that the "Spadefoot Toad smells like peanuts when it is handled," but also that Sadie Orchard was one of the few female stagecoach owners. The book closes with a Washington, D.C., spread, a "Presidents" gallery, including the names of the first ladies; an index; and, as the grand finale, the state flags. Discover: A delightful, oversized browsers' guide to the United States, with 50 state maps jam-packed with stellar facts of every stripe. Four centuries ago, the Artificial Intelligence (AI) ruler, named Talis, created a worldwide peace strategy: hold the children of leaders hostage. The idea was that rulers of nations won't declare war if they know that the moment they do, their children will be killed. Greta, the 16-year-old Crown Princess of the Pan Polar Confederacy (today's Canada), has been trained well at the Fourth Precepture, where royal hostages spend their youth doing farm labor under the strict watch of spidery robots. Greta, a pampered princess on rare home visits but "duchess of chickens and goats" at the Precepture, is prepared to die with grace if the dreaded messenger comes for her. But when a new American hostage named Elián arrives, kicking and yelling in a most undignified way, claiming the system is barbaric, Greta's numb devotion to duty is shaken. Is it possible there's another way to keep peace? Of all the diverse, intriguing characters in The Scorpion Rules, Talis has the most deliciously diabolical voice. His snarky remarks ("Sorry about the constant crushing surveillance and all that") weave a dazzling fabric with the formal voice of Greta, the silky tones of her beloved, goddess-like Himalayan roommate, Xie, and the endearing, unrestrained drawl of Elián. Discover: In this dystopian world, war is kept at bay with peace hostages: the children of world rulers.